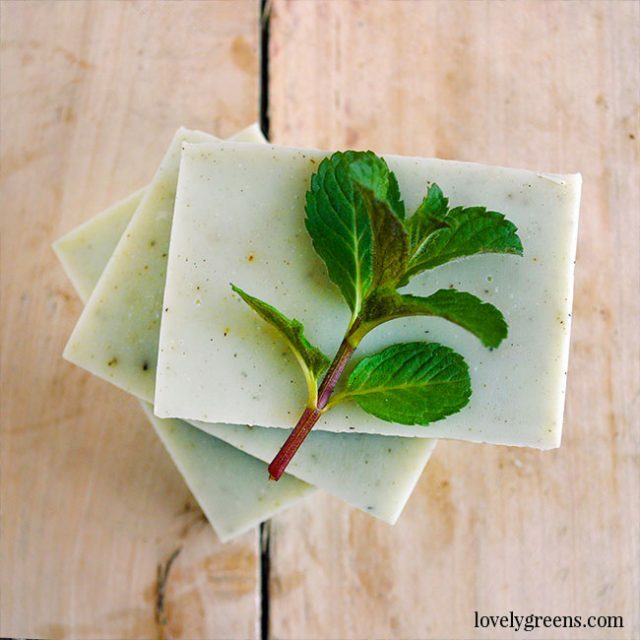 This natural peppermint soap recipe is great for full-body use and is ideal for oily skin. 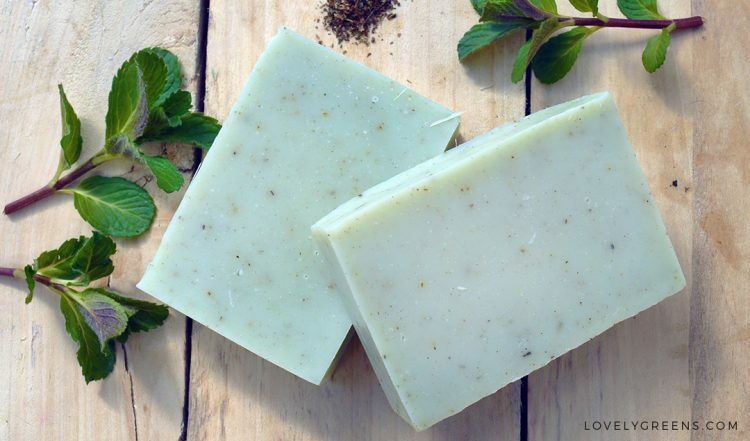 It’s scented with peppermint essential oil that leaves a refreshing and slightly tingly feeling on your skin. 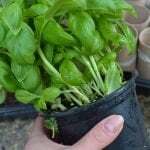 The peppermint leaves in the recipe can come from your own garden or even from a peppermint tea bag. It’s a good basic recipe that uses all natural and/or nature-identical ingredients. It’s a one pound batch that will make five or six mint green bars with pretty flecks. The instructions are also simple and I show exactly how to make it in a video. 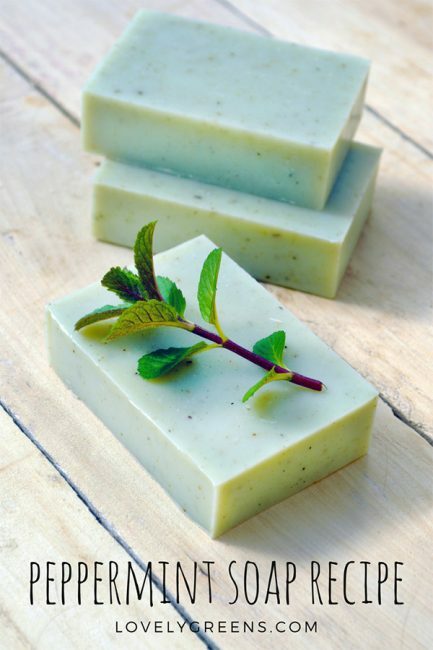 The first batch of soap I ever tried to make was natural Peppermint. That first attempt didn’t go so well and I recall my frustration now nearly seven years after the fact. I eventually figured out how to do it but it was difficult trying to teach myself from books. 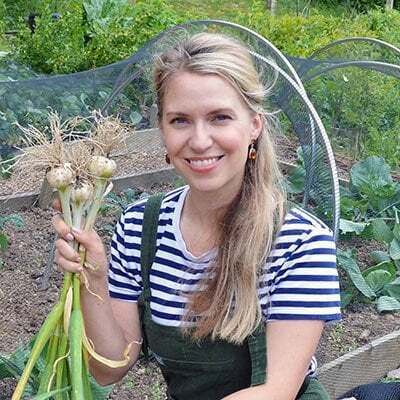 I learn so much better by seeing something done rather than reading about it — can you relate? This first experience is one of the reasons I began offering soap making lessons. It’s also why I’ve chosen to share a Peppermint soap recipe for my very first Facebook LIVE video. You can watch that video at the bottom of the page. 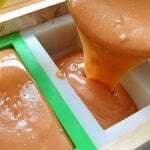 When I make handmade soap I think of the process in four main parts: Lye water, Solid oils, Liquid oils, and everything that happens at ‘Trace’. Trace is when your oils and lye water react and your mix begins to thicken. 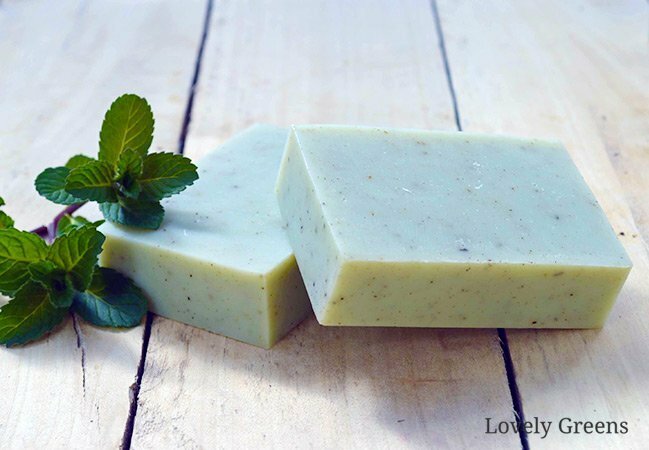 Instructions for this recipe are below but you’ll find even more detailed information in my free 4-part Natural Soap Making for Beginners Series. The 40 minute video at the bottom of the page shows you exactly how this recipe is made. ‘Light Trace’ is the phase when your ingredients change from a liquidy consistency to the thickness of cake batter. ‘Medium Trace’ is when it thickens to a warm custard consistency — I generally always finish working with soap at this stage. ‘Thick Trace’ means your soap is starting to solidify and can be spooned up like thick pudding. With a thick trace you can create textured tops to your bars. 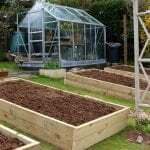 Wearing gloves and eye-protection and in an area with good ventilation mix your lye and water together. Pour all of the lye into the water and then mix with a stainless steel spoon until the lye crystals are dissolved. Next sprinkle in 1/8 of a teaspoon of dried peppermint leaves. These help warm up the colour of your final bars of peppermint soap. Now set the lye water aside to cool — I like to set the jug into a basin of water to speed up the process. Some oils are solid at room temperature and need to be melted. Just after you mix your lye water begin heating your solid oils in a pan on very low heat. They will fully liquefy in around ten minutes but it’s better to take the oils off the heat when there are a few small pieces of solid oil still floating around. They’ll melt with a few stirs of your spoon/spatula. Take the lye-peppermint-water’s temperature with digital thermometer. You’re aiming for it to be around 120°F / 49°C. If it’s close to that take it out of the water so it stops cooling as quickly. You’ve measured all of your liquid oils into another jug. Pour about 1/4 cup of it into a small jar and add the Chromium Green Oxide. This is a mineral colour that will give you a soft green tint. Blend the mineral and oil with a milk frother. When it’s mixed pour it through a strainer and into the pan of melted oils. The strainer helps catch any particles that didn’t blend well. Add the rest of your liquid oils to the pan and make sure to scrape the jug — Castor oil is thick and likes to stick. Give the combined oils in the pan a good stir and take its temperature. You’re aiming for it to be within 5 degrees (Fahrenheit) of the temperature of the lye water. Honestly though, if it’s up to ten degrees from it but within the 110-130°F (49-54°C) range you’ll be fine. When your temperatures are right, pour the lye-peppermint-water into the pan of oils. All in one go, no need to dawdle. Next, place your stick blender into the pan at an angle to minimise the air getting into your soap batter via the stick-blender’s head. Stir the contents of the pan gently, using the stick blender as a spoon. Then bring it into the centre of the pan and while it’s at a standstill, pulse for a couple of seconds. Then gently stir. Repeat this pulse then stir process again and again until the soap thickens up to a ‘Medium Trace’ — the thickness of warm custard. At medium trace add the six drops of grapefruit seed extract, the peppermint essential oil, and the extra 1/8 tsp of dried peppermint leaves. Stir well and until all the leaves and essential oil are well blended. Is there a good substitute for the Palm Oil? 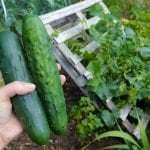 Same measurement for the substitute? Thank you for this nice recipe. Regarding the oils rancidity, is it possible to use vitamin E instead of grapefruit seed extract? Does it have the same effect? If yes, how much should I use? Hi Krystel, using grapefruit seed extract in soap recipes is helpful in cases where the expiration date of the oils is within the next few months. If all your oils have an expiration/best-by date that’s at least a year from now, you can leave it out though. Hope this helps. Thank you for this recipe! Would like to know if we can double the recipe or maybe even triple it? When measuring you ingredients do you weigh them all seperatly and then add them to your pot? Also if I want to add liquid chlorophyll for color would I do that in the liquid oils and how much is ok? 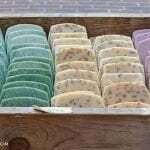 When making soaps I have had the experience of having very soft soap…is this because of an ingredient? 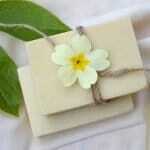 And a last question….can I add clay to color soaps and does the quantity I add matter to the recipe.